Michiel Ubels and Pascal Reinmann win the annual competition for the best graduation videos, films, shorts, and animations. On Friday 15 July, Michiel Ubels won the TAA 2016, the prize for the best video artwork by a graduating artist from a Dutch art academy. Pascal Reinmann won the Best Foreign Film Award, the prize for the best video work by a graduating artist from 2016’s host country, Switzerland. The Public’s Prize was awarded to Dinu Comendant. On behalf of the international jury, Roos Gortzak, director of the Vleeshal, presented the awards before a sold-out auditorium at Cinerama. De Koning van de Waanzin (The King of Madness) by Michiel Ubels wins the TAA 2016. The film is about Patrick, whose life needs some excitement. Patrick begins by making voyeuristic home videos. The film considers our constant urge to prove ourselves and to be always ‘on’, both in reality and on screen. The jury was impressed by Ubels’ experimental portrayal of the protagonist, Patrick. Ubels plays with the boundaries of fiction and documentary, shows great humour in his use of different formats, and experiments with rhythm through the visual and verbal. ‘He has a refreshing approach to editing that echoes our fragmented and layered reality.’ Michiel Ubels graduated from the Academy of Fine Arts in Maastricht with his film De Koning van de Waanzin. He wins a residency and a working budget at Atelier Mondial in Basel, Switzerland. Millimeterle by Pascal Reinmann wins the Best Foreign Film Award. The fifteen-minute film shows the sexual awakening of adolescent boys and the possibility of peer pressure violence. The jury commends the film’s visual language through which Reinemann successfully conveys a sense of claustrophobia. Reinmann also shows great skill and sensitivity in directing young actors. ‘It is a convincing portrait of a joint endeavour, for which Reinemann had to gain the confidence of the young actors.’ Pascal Reinmann graduated from the Hochschule der Künste in Zurich. He wins a residency and a working budget at Het Wilde Weten in Rotterdam. Giovanni Carmine, director of Kunst Halle Sankt Gallen, awarded the Public’s Prize to Dinu Comendant from the Royal Academy of Art in The Hague for his stop-motion film The Walking Thinker. On Friday July 15, the nominated films were shown at the Cinerama cinema and the international jury announced the winners. Roos Gortzak, director of the Vleeshal in Middelburg, led this year’s jury: Giovanni Carmine, director Kunst Halle Sankt Gallen, Switzerland, Sabine Himmelsbach, Haus der Künste’s electronic Basel, Switzerland, and the artist duo and TAA 2009 winners Witte van Hulzen & Sander Breure. 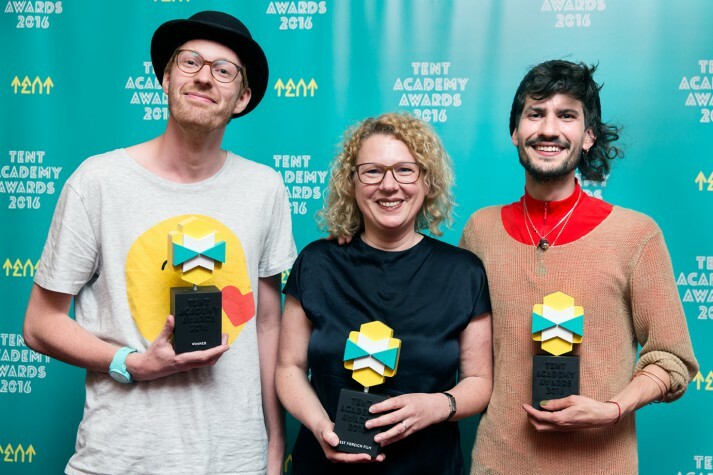 The TAA is organised annually by TENT, Rotterdam’s platform for contemporary art. The TAA offers a podium to young audio-visual talent and a springboard to greater publicity for graduating artists. All nominated films are shown at TENT until 18 September.